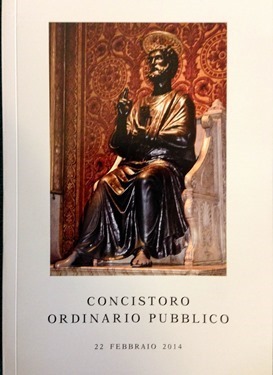 This week, the announcement was made that the Holy Father is establishing a new dicastery for finance in the Vatican. 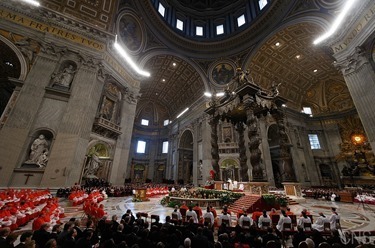 This department will oversee all the finances and human resources of the Vatican and will unify all the financial departments in the Vatican under one structure, something like the Treasury Department in the United States. It will be a way to guarantee greater transparency and efficiency as well as allow the Holy Father to ensure that the resources of the Church are used to the best possible advantage in our service to the poor and our mission of evangelization. Heading this new group up is one of the cardinals on the Holy Father’s Council of Cardinals, Cardinal George Pell of Sydney. I told the Holy Father that I think that he needed a rugby player for this task, and apparently he agreed! 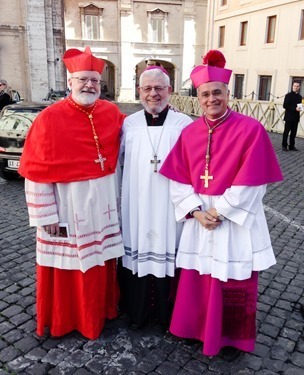 As I mentioned in my last post, I was in Rome much of last week for meetings in advance of the consistory at which the Holy Father created 19 new cardinals. 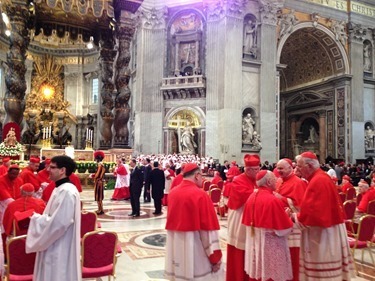 The ceremony on Saturday consisted of a Liturgy of the Word with the creation the Cardinals. 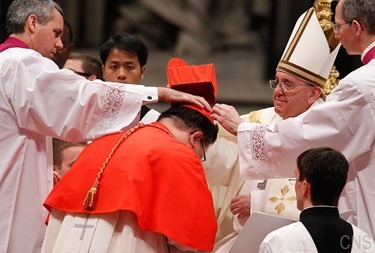 During the ceremony, each of new cardinals goes up to the Holy Father and kneels down. 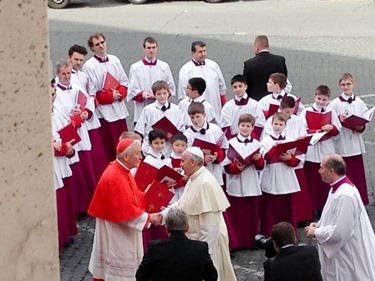 Holy Father then places the biretta (the “red hat”) on their head and a ring on their finger. 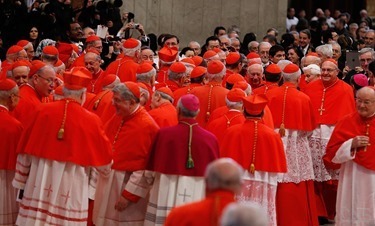 After that, each of the new cardinals greets the other members of the College of Cardinals. 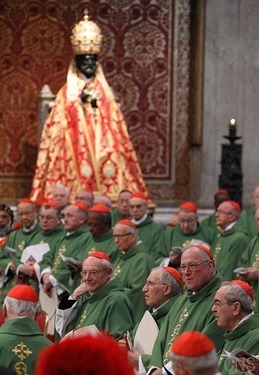 The consistory was held on the Feast of the Chair of Peter. 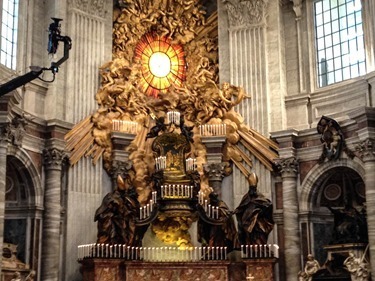 For the feast, they decorate the Chair of Peter inside the Basilica with candles and they dress the statue of St. Peter in the papal vestments. 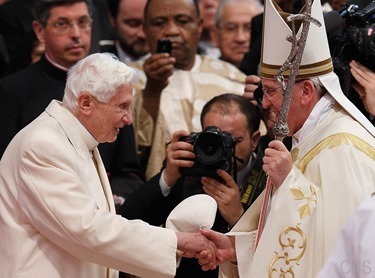 While a consistory is always a wonderful occasion, it was made even more special by the arrival of Pope Emeritus Benedict just before the start of the ceremony. It was quite unexpected and I was very happy I had a chance to speak with him. Pope Benedict looked very good, though I think he may have been overwhelmed by the rush of people who came to greet him when he came in. In all, he seemed to be in good form and good spirits. Another unexpected aspect of the ceremony (though not quite so surprising as the arrival of Pope Benedict) was that at the end of the ceremony Pope Francis, instead of going into the procession as you would expect him to, walked all the way around the cardinals to the statue of St. Peter to kiss its foot. If you have ever been to St. Peter’s Basilica and seen that statue, you know that the foot is practically worn away by people touching it and kissing it. 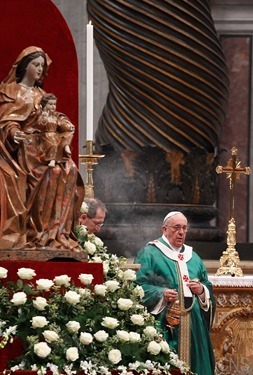 So, I think this was just one way of the Holy Father showing that he is a pilgrim, just like any of the other millions of pilgrims who have come to pray at the tomb of St. Peter and have venerated that statue. 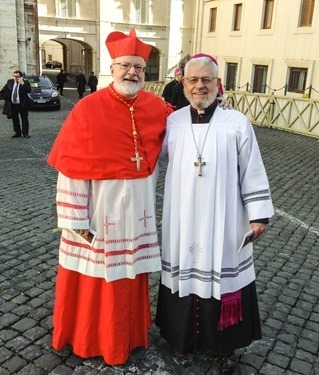 After the ceremony, I was happy to see my classmate Bishop Pablo Schmitz from the Diocese of Bluefields, Nicaragua. 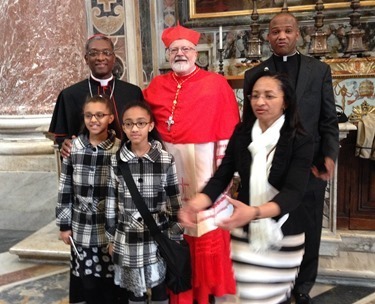 He was in Rome for his Metropolitan, the new Cardinal from Managua, Cardinal Leopoldo Brenes Solórzano. On Saturday evening, after the consistory, I was back in my room at the Casa Santa Marta when I heard singing coming from outside. 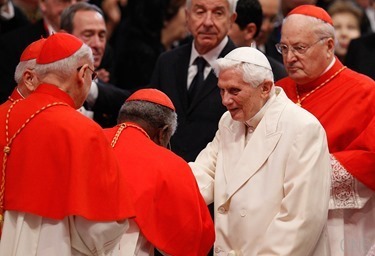 The following day, Sunday, there was the Mass of Thanksgiving at which all the cardinals concelebrate with the Holy Father. 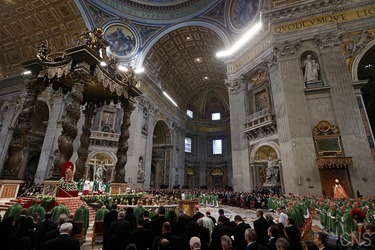 On both occasions, the Holy Father gave beautiful homilies. After the Mass, I was invited by Haitian President Michel Martelly to a luncheon with the new cardinal from Haiti, Cardinal Chibly Langlois, and some of the clergy of Haiti who were in Rome for the consistory. 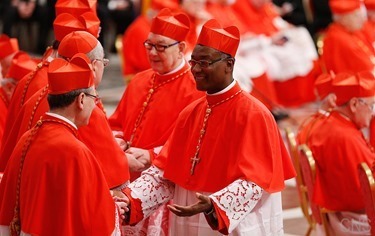 Among the guests were Cardinal Peter Turkson, myself and Cardinal Robert Sarah from Guinea, who is presently the President of the Pontifical Council Cor Unum. At the luncheon, I took a picture with some family members of Cardinal Langlois who are from Boston. The two little girls go to the Cheverus School in Malden. 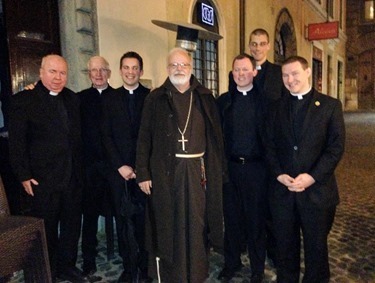 Sunday night we had dinner with our seminarians in Rome, Monsignor Kelly and Monsignor McRae. 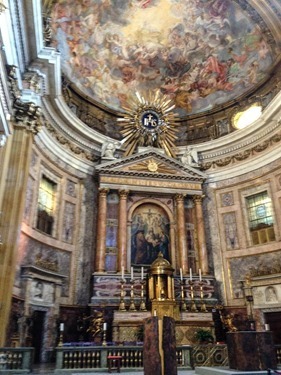 On Monday, I had a chance to visit the Church of the Gesù the mother church of the Jesuit order. 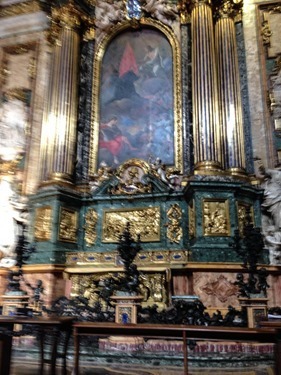 The altar with the tomb of the relic of the arm of St. Francis Xavier. 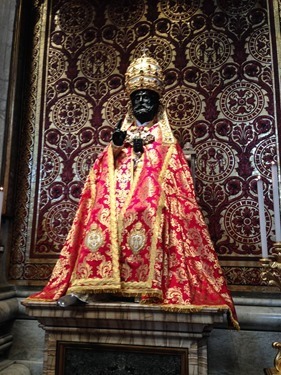 The great importance of that relic is that, with that arm, he baptized hundreds of thousands of people. 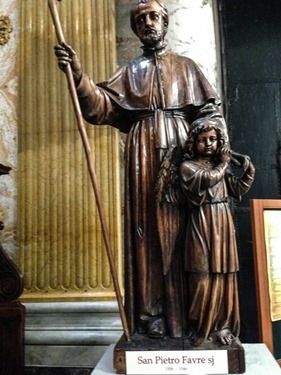 There is also a statue of the new Jesuit saint, St. Peter Faber, whom the Holy Father canonized without any ceremony in December, which is unusual but not unheard of. The reason I took note of it is because the residence for young Jesuits in Boston is called The Blessed Peter Faber Community and I suppose now they are going to have to change their sign to read “The St. Peter Faber Community,” just as Blessed John XXIII National Seminary will have to change their sign when their patron becomes St. John XXIII. On the other hand, I suppose both communities should be pleased they are getting an upgrade — from blesseds to saints!